Do you know your different labels? A difference does exist between stickers and labels although generally are referred to as one or another. Stickers are classified based upon the type of material which the label is printed upon (usually referred to as a 'substrate'). Normally labels are classified according to the type of adhesive used in their construction. As one would expect, paper is the most common type of substrate and often known as a 'sticker'. There are many different types of labels in the marketplace that are used by various businesses. It's important that decision-makers recognise and appreciate the benefits derived from their chosen label prior to confirming orders. 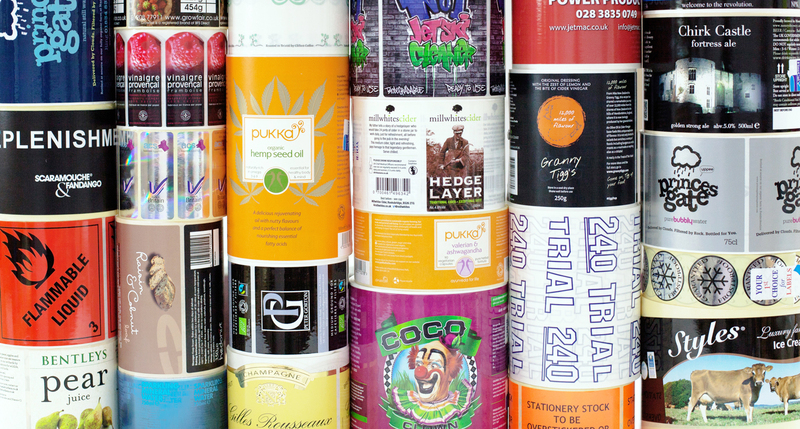 Labels generally tend to be printed by manufacturers and supplied to clients separately (these can apply to large size formats), on rolls / reels, or set out on sheets. Labels can be applied manually or automatically. They are generally simple to peel from the backing or release liner and can be applied by hand, via label dispensers or specialist applicator equipment to speed up the task. Paper is a more economic material to either have printed or offered in plain format as die-cuts on sheets. However may be susceptible to adverse temperatures unless over-varnished. Plastic based labels have many benefits over paper types because they are more durable and the print finish is superior due to the smooth surface. Also they're available in transparent form. Foil labels look great because they are in fact bright metalized materials and appear shiny. They have excellent durability depending on the adhesive used. They are ideal for products that may be exposed to different environments and may last up to several years outdoors. They can also provide great resistance to solvents, abrasion and chemical attack. Before placing your label or sticker order, it is important that you appreciate the different types of adhesives available on labels. Permanent adhesives are generally the most common and are used when the label is not meant to be removed. Removable adhesives on the other hand, mean that the label can be removed completely but does depend on the substrate type and time element spent - normally 6 months; after this approximate time the removability lessens appreciably and becomes permanent. Other specialist adhesives include freezer grades where products are subject to very low temperatures indeed. Get in touch with our office on 0117 971 1111 or send an email to labels@finecal.co.uk to see how we can design and print great sticky labels for you.